Thousand Oaks, CA – Dr. Michael Schwartz, a Thousand Oaks plastic surgeon, recently welcomed Karen Lauridsen, an Ultherapy specialist, to his practice. Ultherapy lifts and tightens skin in a non-invasive procedure that can be completed in 60 to 90 minutes. This ultrasound treatment goes beneath the surface layer of the skin and targets the skin’s foundation—the same layer of the skin that is targeted in a traditional facelift. Ultherapy also stimulates the production of the skin’s collagen, providing a more natural way to rejuvenate the skin. Dr. Schwartz has been working to minimize the discomfort some patients experience during Ultherapy. The procedure can cause discomfort around the cheekbone, the eyebrow bone, and the jawbone because the surface layer of skin is thinner in those areas. Topical numbing agents alone are not effective at minimizing pain because these numbing agents only affect the surface layer of the skin and the Ultherapy laser itself must go deeper than that surface layer to reach the same layers of skin typically targeted by a traditional facelift. 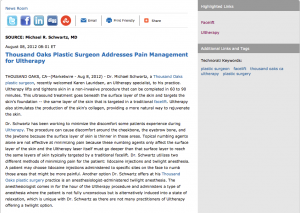 Dr. Schwartz utilizes two different methods of minimizing pain for the patient: lidocaine injections and twilight anesthesia. A patient may choose lidocaine injections administered to specific sites on the face to numb those areas that might be more painful. Another option Dr. Schwartz offers at his Thousand Oaks plastic surgery practice is an anesthesiologist-administered twilight anesthesia. The anesthesiologist comes in for the hour of the Ultherapy procedure and administers a type of anesthesia where the patient is not fully unconscious but is alternatively induced into a state of relaxation, which is unique with Dr. Schwartz as there are not many practitioners of Ultherapy offering a twilight option. Dr. Schwartz was the first plastic surgeon to offer Ultherapy in Ventura County, as a non-surgical treatment for those seeking an alternative to the traditional facelift. The treatment is also designed to be completed in a single visit and no downtime is associated with the procedure – an added benefit for patients. During the three to six months following the treatment, the patient’s skin will gradually lift, creating a more refreshed, rejuvenated look. Dr. Michael Schwartz, a double-certified member of the American Board of Plastic Surgery and The American Society for Aesthetic Plastic Surgery, is also a fellow in the American College of Surgeons. Dr. Schwartz completed his Plastic Surgery training at The University of Texas Southwestern in Dallas. His training in Plastic and Reconstructive surgery included extensive training in all areas of cosmetic surgery. He has authored and presented numerous papers, and has been an invited speaker at several national plastic surgery meetings. Dr. Schwartz has also been honored with several teaching awards and is a member of the Mentor Educational Council, a role in which he speaks around the country on behalf of the Mentor Corporation. He specializes in breast, body contouring, and facial surgery. To contact Dr. Michael Schwartz, visit his website at drschwartz.com or call 805-435-8256. His office is located at 696 Hampshire Road, Suite 210, Westlake Village, CA 91361.